Companies produce huge amounts of material in digital form; images, powerpoint presentations, texts, catalogs, PDF brochures, videos etc. – all materials that consume a lot of time and money to produce. Most of these assets should be retained while some are only temporary. This DAM seminar will deal with these challenges, approaches, solutions and will show real-life examples. The DAM Helsinki 2016 seminar gives you an international perspective of DAM. Check how it´s been implemented in Scandinavia. Learn from Finnish customers use cases. And see new technologies arise like Virtual Reality etc. These contributions are aimed to benefit you and your business. The DAM Helsinki 2016 seminar focuses on contemporary ways to manage and use digital assets. We will guide you through the digital journey and try to simplify the way how to begin. Many companies and organizations have implemented functional solutions into everyday activities. Brand Management streamlines day-to-day operations from creation to consumption more efficient. Your team needs the right assets at the right time! Who can afford to be left behind of your competitors? Follow hints, views and experiences as told by the experts and users themselves! 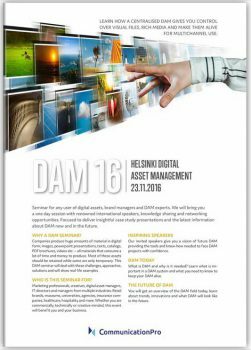 Click to read our DAM 16 brochure!